Amid the flurry of commercial and open source giant projects, Learning Equality has set out to revolutionize education for low-resource communities around the globe with its Open Source Rookies winner Kolibri. Kolibri seeks to make learning resources available to students and teachers in areas with limited education resources, from rural schools and after-school programs to refugee camps and orphanages. How did the Kolibri project get started? The idea for Kolibri has been part of Learning Equality’s vision from the very beginning. Our co-founders had a strong desire to provide a solution for learners around the world in low-resource contexts to access a comprehensive digital curriculum and have built-in tools that support effective blended learning. Our first platform, KA Lite, was launched in 2012, and is now providing local, offline access to Khan Academy content to millions of learners in over 175 countries and territories. This success helped to open the door for the development of Kolibri, which greatly expands on everything we could offer with KA Lite. Was there any true “champion” for the Kolibri project? I really think the whole team gets an MVP award, especially for the work towards the initial crowdfunding campaign in 2015 that met over 200% of its original funding goal. I hadn’t joined the team yet so I’m not shy to brag about their work! We’re still a pretty small organization, but we’re a very mission-driven group and each person has been integral to Kolibri’s development in different ways. What makes it different or unique? There’s a multitude of high quality educational materials out there, but thus far they have largely existed online and housed separately from one another. What makes Kolibri unique is that it offers a way to bring different content sources offline into a central repository in a structured way. It can be harder to find openly licensed content that’s available in a variety of different languages, so we are prioritizing that when looking for content providers. We’re supporting translation work as well. Beyond that, it brings in a host of tools to help align the content with national and local curricular standards, and on the student side it offers a self-paced personalized learning experience with support tools for teachers to track student progress. How did you build your community? One of the things that I found to be most amazing about our user base when I joined the team is that it’s grown largely by word of mouth. 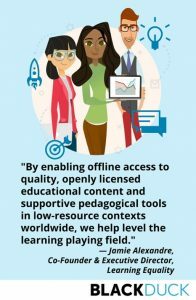 We work with several implementing partners who have brought KA Lite and now Kolibri to communities around the world on a large scale, but the majority of the four million users came organically from creating something that filled an urgent global need for offline access to high quality education. How did you attract such a large project team so quickly? Our growth in just the six months since I’ve joined has been fun to watch. We’ve grown from 13 to 20 team members in that time. Our increase in capacity has largely come from our recent funding support from Google.org, which has allowed us in particular to build out our content and curriculum team in preparation for launching Kolibri this summer. From the beginning, we have also actively engaged the global open source community in our projects, as well as a steady stream of fantastic undergraduate interns at the University of California, San Diego, where our offices are based. What is your philosophy on building community? I think the people in the international education space are some of the most passionate and friendly people you’ll come across. We’re all working towards the same goal of making education more accessible, higher quality, and more equitable, and there’s so much positive energy that you can’t help but want to build off of it and get involved. We also think it’s important to have a way for our community of users to connect with us and one another, so we have a support forum and a deployment map to encourage the sharing of stories. It can feel isolating to be on the ground spearheading this work in a local community and it helps to know you’re not alone, no matter how spread apart everyone is. What other technologies is your project is aligned to? The idea for our first generation platform, KA Lite, was sparked when the Raspberry Pi first came out. Jamie was interning at Khan Academy and had the idea with a fellow intern to use the Raspberry Pi to bring the Khan Academy content offline. A lot has happened since then, but low-cost hardware options such as the Raspberry Pi are still integral to making the use of Kolibri a reality in low-resource contexts. What other open source projects are you leveraging to create the project? Both KA Lite and Kolibri are built around Python and Django on the backend, and we’re very grateful for the open-source communities that have put so much work into those amazing technologies. In Kolibri, we also leverage Django REST Framework, Python Requests, CherryPy, Khan Academy’s Perseus exercise renderer, Postgres, SQLite, Sphinx, Karma, Webpack, Vue.js, and Keen UI, amongst many other incredible tools. We also try to give back to the community wherever we can, contributing patches and bug reports, and producing packages that are reusable by the community. We’ve also financially sponsored work on external packages that we use (such as the amazing Keen UI project). What are your long-term goals for the project? Our moonshot goal is to eventually provide low-resource contexts with a complete primary and secondary offline digital curriculum, in every language of the world, aligned to every national and state curricular standard. In parallel, we want Kolibri to provide built-in tools for teachers, students and administrators that support an engaging and effective learning experience. What are your specific goals for the upcoming year? Aside from continuing to develop and improve upon key features of Kolibri, one of our primary goals for the next year is to build out a diverse content library. We hope to bring in a wide array of content that caters to multiple different subject areas and languages and then to make the library accessible at scale through our partnership work. We’re also eager to start to learn more about what implementation models work best in each learning context so that we can knowledgeably share that information with other users. What are some opportunities for Kolibri? As we come closer to launching Kolibri, we’re excited to build relationships with other organizations and leverage their areas of expertise while providing our own unique services through Kolibri. We recognize that we can’t do this alone and will continue to rely on the support of implementing partners for understanding the best learning models and curricular needs of each context Kolibri is used in. What are some challenges Kolibri may face? Identifying openly licensed content (particularly in local languages) that can best support partner needs as well as gaps in learning, is an ongoing challenge, along with sourcing in-country support to help align the content to local curricular standards. Once we have content that is locally aligned with a national curriculum available, we can make it available for use by any implementing organization or government school in-country, while also serving as an example for other countries. As an open-source project, there are numerous areas for collaboration to help Kolibri fly, such as by contributing to Kolibri on Github, translating the Kolibri platform, or participating in Learning Equality’s community forum. For general information about how you can be a part of it, please contact info@learningequality.org. Learn more about Open Source Rookies.